There was another amazing fancy dress party round Ana’s house. This time it was on Valentines day, with a bloody valentines theme. I did the old flour-on-the-face trick and put on a suite and bow tie, while Francine dressed in a scraggly wedding dress. 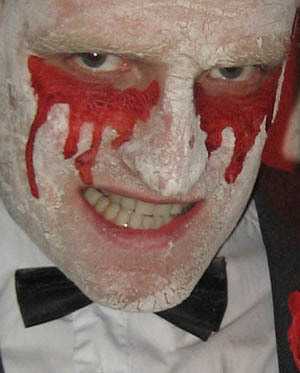 Then we both applied fake blood liberally. Our blood recipe was scarlet food colouring with water and cornflour stirred in to thicken it a little, but then to make it less vibrant pink we added a dash of soy sauce! 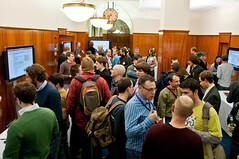 We had our big Cloudmade launch event on Thursday. All the key people at cloudmade have been very heavily focussed on preparation for this for some time now, and it seemed to pay off. 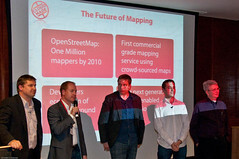 The guys did a great job with slick professional talks getting across our message, that the openstreetmap project is opening up exciting new opportunities for mapping and location-based services, above and beyond anything that google maps could ever offer, and that cloudmade’s products and services help to bring that power to your applications. They’ll be more product release announcements like this one on the cloudmade blog, over the coming months, which will no doubt generate even more buzz. My job for the evening was to man a demo station. Answering people’s questions about openstreetmap and cloudmade, with a big plasma screen behind me. This turned out to be really quite fun. These photos and many more great pictures taken by Christian Petersen at the event. Afterwards we had a little after-show party, which got a bit more messy.